There’s nothing like saying “I do” with your toes in the sand and ocean waves lapping in the distance. As far as wardrobe, dressing for the elements is key, so stray away from heavy fabrics and overwhelming silhouettes (i.e. ballgowns). Feel the sun on your shoulders in a strapless mermaid wedding dress with lace and tulle accents as your best girls stand aside in chic sage bridesmaid dresses, perfect for a natural setting like the beach. For the bride who lives for the hustle and bustle, is there any atmosphere more fitting than a city? Whether in a hotel ballroom or rooftop overlooking the skyline, complement the cosmopolitan vibes with a wedding gown that’s a mesh of modern and classic! 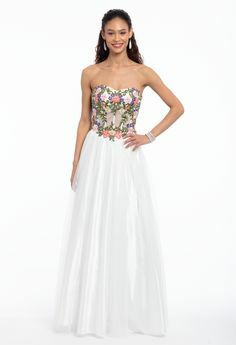 An illusion beaded bodice dresses up a simple sheath silhouette, making for easy maneuvering as you mingle with guests. 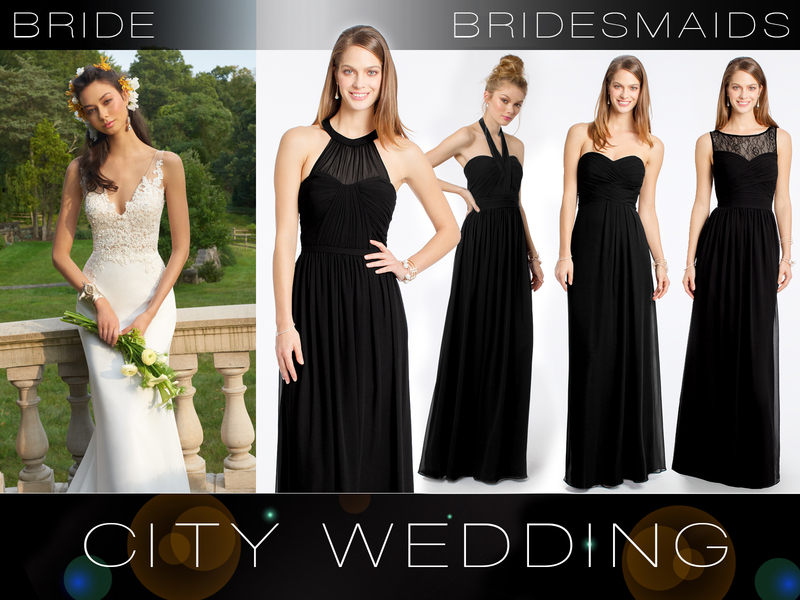 Dress your girls in flattering black bridesmaid dresses for a streamlined finish that radiates sophistication. Vintage, serene, and endlessly scenic; is there anything more romantic than a vineyard wedding? Accent the rustic atmosphere with classic style that suits the elements. This tulle and beaded lace mermaid wedding dress is a flawless blend of rustic and chic; the lace appliques ring traditional while pretty beading elegantly sparkles in the sunlight. Give a nod to the grapery with (what else?) 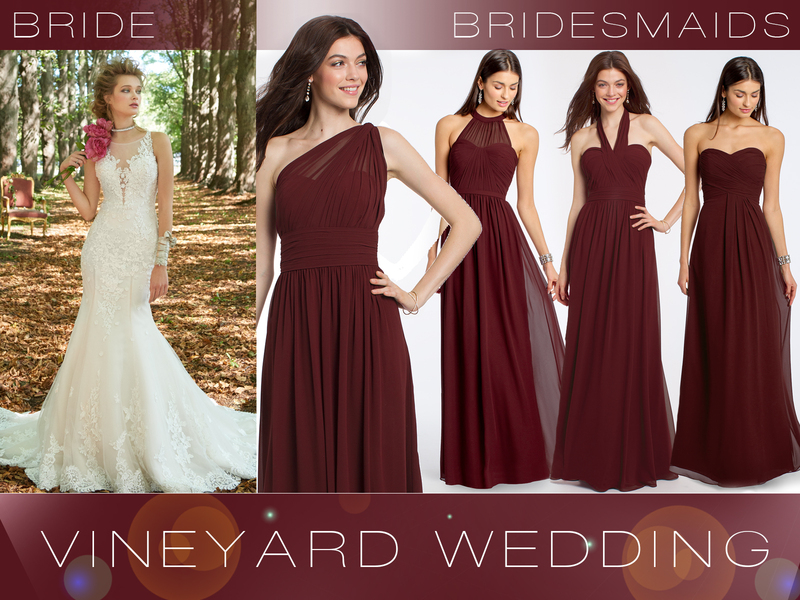 wine bridesmaid dresses. Simply lovely. Whether it’s a grand estate soiree or more of an intimate tea party, a garden wedding certainly has a fairytale feel. Let your style paint the picture of happily ever after by choosing an off the shoulder wedding dress bearing delicate applique detailing and a sweeping train. 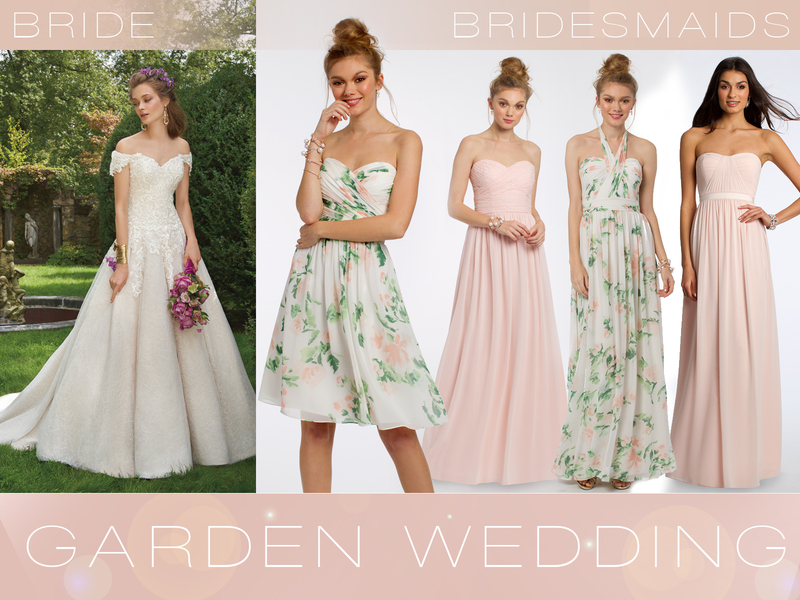 Play mix and match with your ‘maids by selecting a blend of floral and petal pink bridesmaid dresses. Trading “I do’s” with purple mountain majesties looming in the distance? Cue the sighs. Rugged terrain may call for unpredictable weather; hence “dressing for the elements” holds strong meaning here. A long sleeve wedding dress is effortlessly romantic and keeps chilly breezes at bay. As for your ladies? 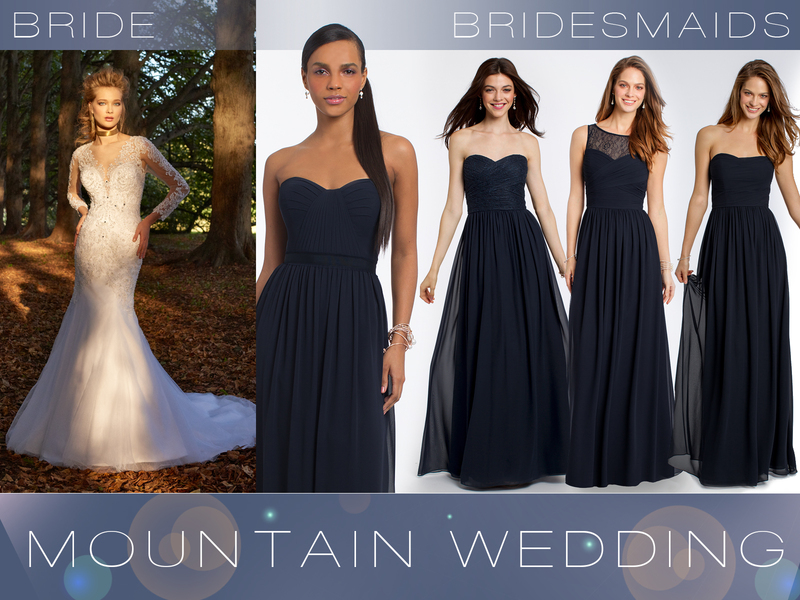 Enhance the outdoor environment without going too over the top with navy bridesmaid dresses. Find more timeless bridal party style for every venue on CLV.com.